On the 7-th of March 2018 a cooperation agreement between Ministry of Ecology and Natural Resources of Ukraine and Space Research Institute NAS Ukraine and SSA Ukraine (SRI NASU-SSAU) was signed. The territory of Ukraine is large in area, and therefore the process of building land cover maps for the whole territory of the country requires the development and exploitation of automated methods based on artificial intelligence and machine learning over the time series of satellite data. Taking into account the large amount of satellite data that should to be processed for land cover creation, solving this problem requires the use of high-performance cloud computing with fast data access. SRI NASU-SSAU is a leading scientific institution in the field of development and exploitation of machine learning technologies for geospatial information processing. The methods developed by our experts and the cloud-based classification technologies based on deep learing technicues provide a possibility to assess the indicators and to monitor the achievement of the goals of sustainable development over the territory of whole country. Ukraine is a party of international programs, conventions and initiatives (including ones on the UN level) for environmental monitoring, in particular the United Nations Framework Convention on Climate Change, the Kyoto Protocol, the UN Convention to Combat Desertification, etc. 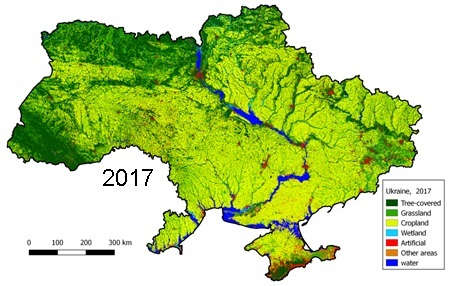 As part of this activity, international institutions require from the Ministry of Ecology and Natural Resources of Ukraine to create land cover maps for the whole country on a regular basis and assess existing changes in land use. The experience of SRI NASU-SSAU will help fulfill the commitments undertaken by Ukraine and promote fruitful cooperation with the Ministry of Environment.